Through the popularity of this column, I get correspondence from all over the country. 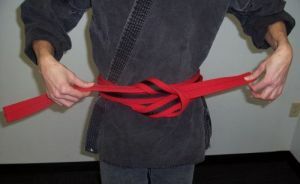 And the most commonly asked question is, “How long does it take to get a black belt?” I don’t know how this question is answered in other schools, but my students know that asking such a question in my dojo would set them back several years in their training. It would be a disaster. Most people would be overjoyed if I would say it takes just a couple of years to get a black belt, but unfortunately it does not. 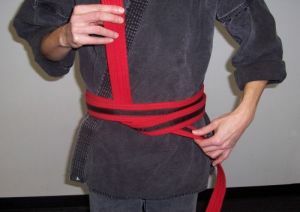 And though I am afraid most people would not be happy with my answer, I think the general misconceptions about “what is a black belt?” should be clarified as much as possible. This is not a popular subject to discuss in the way I am going to. Indeed, I warn my students not to ask the How do you get a black belt? You find a competent teacher and a good school, begin training and work hard. Someday, who knows when, it will come. It is not easy, but it’s worth it. It may take one year; it may take ten years. You may never achieve it. When you come to realize that the black belt is not as important as the practice itself, you are probably approaching black belt level. When you realize that no matter how long or how hard you train, there is lifetime of study and practice ahead of you until you die, you are probably getting close to a black belt. 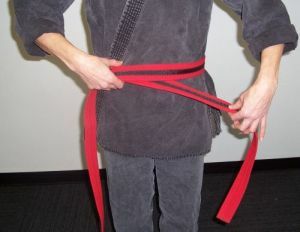 At whatever level you achieve, if you think you “deserve” a black belt, or if you think you are now “good enough” to be a black belt, you are way off the mark, and, indeed a very long way from reaching your black belt. Train hard, be humble, don’t show off in front of your teacher or other students, don’t complain about any task and do your best in everything in your life. This is what it means to be a black belt. To be overconfident, to show off your skill, to be competitive, to look down on others, to show a lack of respect, and pick and chose what you do and don’t do (believing that some jobs are beneath your dignity) characterize the student who will never achieve black belt. 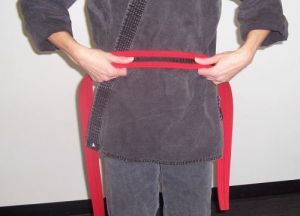 What they wear around their waist is simply a piece of merchandise bought for a few dollars in a martial arts supply store. 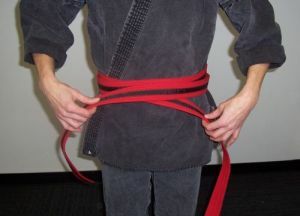 The real black belt, worn by a real black belt holder, is the white belt of a beginner, turned black by the color of his blood and sweat. 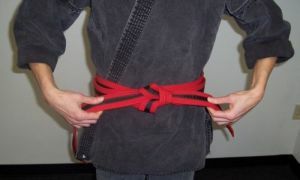 The first level of black belt in Japanese is called shodan. It literally means “first level”. Sho (first) is an interesting ideograph. It is comprised of two radicals meaning “cloth” and “knife”. To make a piece of clothing, one first cuts out the pattern on the cloth. The pattern determines the style and look of the final product. If the pattern is out of proportion or in error, the clothes will look bad and not fit properly. In the same way, your initial training to reach black belt is very important; it determines how you will eventually turn out as a black belt. What do you focus on if you don’t focus on attaining your black belt? It is easier said than done, but you must focus your energy on practice. However, to think, “I will concentrate on my training to get a black belt”, is simply playing mind games with yourself and will ultimately lead to your own disappointment. Can you simply think, “I will forget about rank completely?” Can you simply say to yourself that you will never achieve it? Will you always be attached to your black belt, allowing the idea to linger in the back of your mind? In other words, can you simply concentrate on your training without regards for anything else? 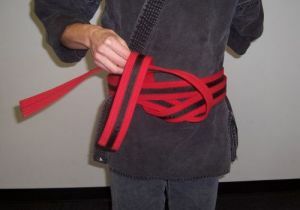 Can you finally realize that your black belt is nothing more than “something to hold up your pants”? How do we focus on our training? Successful training means, to a great degree, that we look at what we do from a reasonable and realistic viewpoint. More often than not, we are not looking at realistic goals but dreams and delusions. Do you want to excel in martial arts as a way to improve yourself and your life, or are you motivated by the latest cops and robber’s movie? Is your practice motivated by a strong desire to enlighten yourself, or do you simply want to imitate the latest martial arts movie stars? Although experienced martial artists may snicker, it is amazing how many inquire about martial arts saying they want to just like Chuck Norris or Steven Seagal. But those people are themselves by their own efforts. You are yourself. We all have our hero, role models, and our dreams, but we have to separate out fantasies from reality if our training is to be meaningful and successful. Training has nothing to do with rank or black belts, trophies or badges. Martial arts are not simply playing out our fantasies. It has to do with your own life and death. It is not only how we protect ourselves in a critical, lethal situation, but how we protect the lives of others as well. You cannot be another person, whether he is a movie star, great teacher or multi-millionaire. You must become yourself – your true self. As much as John Doe dreams about becoming James Dean, Bruce Lee, or Donald Trump, he can only be John Doe. When John Doe becomes John Doe 100 percent, he has become enlightened to his true self. An average person only lives 50 percent or maybe 80 percent of his life and never knows who he is. A martial artist lives 100 percent of his life and becomes impeccable. This is what the true black belt holder must come to realize within himself. He is no other than himself, and his practice leads to enlightenment into the nature of true self, his real self. This is the essence of our training in martial arts. 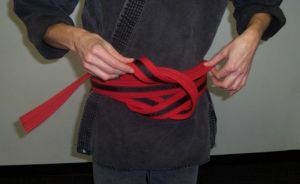 Think of losing your black belt, not gaining it. Sawaki Kodo, a Zen Master, often said, “To gain is suffering; loss is enlightenment.” If someone were to ask the difference between martial artists of previous generations and martial artists today, I would sum it up like this. Martial artists of previous generations looked upon training as “loss”. They gave up everything for their art and their practice. They gave up their families, jobs security, fame, money, everything, to accomplish them. Today, we only think of gain. “I want this, I want that.” We want to practice martial arts but we also want money, a nice car, fame, portable telephones and everything that everyone else has. Shakyamuni Buddha gave up his kingdom, his palaces, a beautiful wife, and everything else to finally seek out enlightenment. The first student of Boddhidharma, considered the founder of Shaolin Kung Fu, cut off his left arm to study with his teacher. Now we don’t have to take such drastic measures to learn martial arts today, but we should not forget the spirit and determination of the great masters of the past. We must realize that we have to make sacrifices in our own lives in order to pursue our training. When the student looks at his training from the standpoint of loss instead of gain, he comes close to the spirit of mastery, and truly becomes worthy of a black belt. Only when you finally give up all thought of rank, belts, trophies, fame, money and mastery itself, will you achieve what is really important in you training. Be humble, be gentle. Care for others and put everyone before yourself. To study martial arts is to study yourself – you true self. It has nothing to do with rank.